I just went to a screening of Restrepo by Vanity Fair journalist and “The Perfect Storm” author Sebastian Junger and British film-maker Tim Hetherington. The New York Times has an excellent review of the movie here, while Rotten Tomatoes currently rates it 90%. It’s powerful stuff. They spent a year doing one month periods embedded with a platoon in the Korangal Valley, arguably the most dangerous place in all Afghanistan. Seventy percent of all the ordinance used in the entire Afghan war was used in the Korangal Valley. It looks like one of the most mountainous, remote and desolate hell-holes on the face of the planet. Junger is anti-Iraq war but says the Afghan war was at least more justifiable. He takes great pains in Restrepo however, to avoid taking sides or having a political message. It sure is. As a kid I used to love playing war. I used to dress up in camo with my toy guns (and real hunting knife) and play-act mock wars. I had Action Man, GI Joe, figurines, you name it. As a big reader though, I gradually grew away from war and hunting, and although every guy likes to think he could handle himself should the need arise, I was never attracted to joining the armed forces. Watching this movie really brought home to me why that was. Restrepo is certainly thrilling, but I frequently found myself thinking, ‘There’s no way I could do that’. Living with the constant fear of death and dismemberment – for yourself and your friends, being surrounded only by men for vast periods of time, inadvertently killing civilians; all while thousands of miles from home. And for what? Not for me thanks. At regular intervals during the movie you find yourself thinking, ‘What’s the point?’ It’s hard to truly convey how much this mission feels like such a misguided waste of time and effort. 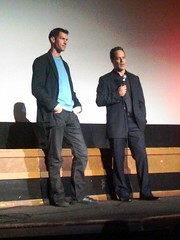 After the movie Junger came on stage and answered questions from the audience. I got the chance to briefly speak with him after the Q & A and put it to him that the experience must’ve been terrifying? “Not really”, he replied. “You get used to it”. He seems conflicted about the war, saying that he could make just as powerful arguments for or against leaving. One statistic he mentioned stuck in my head though. 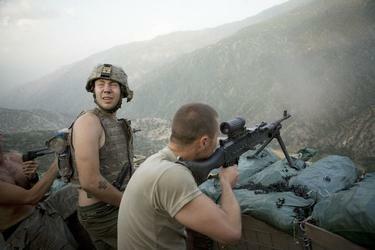 Since NATO forces began operations in Afghanistan in 2001, 16,000 civilians have been killed. That’s horrifying. But contrast that with the amount killed by Afghan warlords and the Taleban during the preceding decade: 400,000 civilians dead. So clearly by that metric alone the war effort there isn’t pointless. And it begs the question, after all that blood and treasure spent improving the country – particularly in terms of roads, schools, infrastructure, and the lives of women – not to mention the amount of deaths prevented; how prudent is it for the US to leave Afghanistan before they have established a viable state that’s at least able to maintain the current level of security? Like most people I’m not a huge fan of real-life war, but for a situation like Afghanistan the US really could make a difference there – it’s just that to do so in a lasting way will take another ten years. Pulling out before then will recreate the same power vacuum that led to the formation of the Taliban in the late 80’s/early 90’s, and America is currently not famous for its long term political horizons. Restrepo opens in New York this Friday the 25th at the Angelika Film Center, various states around America from July 2nd, and globally look for it at your next film festival. Update: The now infamous Rolling Stone article on Afghan commander General Stanley McChystal, harshly critical of the current COIN counter-insurgency strategy in Afghanistan is here. Update 2: McChrystal is gone, to be replaced by Petraeus (who literally wrote the book on COIN).